54cm Freestanding Electric Cooker is rated 3.4 out of 5 by 10. 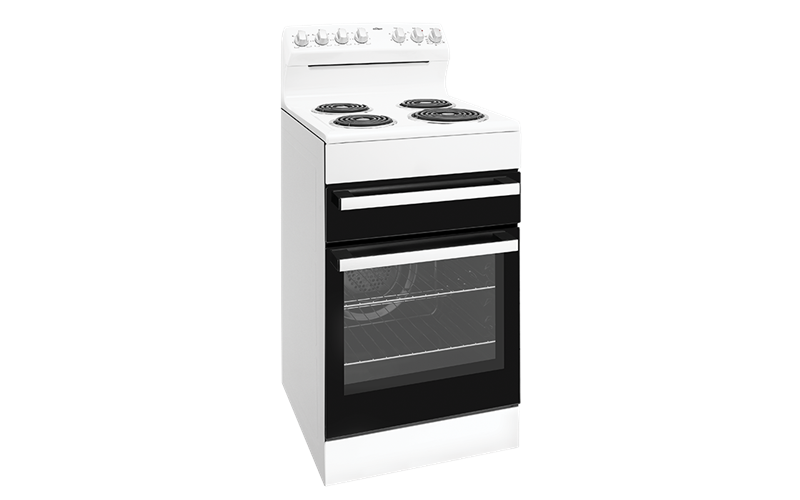 54cm freestanding cooker with rear control, fan forced oven, separate grill, oven light and electric hob with 4 coil elements. Easy to reach rear control system which offers you and your family peace of mind while cooking by keeping oven controls up from children's reach. Rated 1 out of 5 by Tissy from Basic I purchased this stove in January. Whilst I am aware that it is a basic model, it is certainly the worst stove I have ever used. When the oven is one the whole stove rattles. I have had it checked and it is level, it is just the pressure of the oven fan. I also had to find out why the top coils and th whole stove got hot when the oven is on. Bad design. There are no drip trays under each hot plate on the top of the stove, only one flat piece of metal under all four plates. I have not been able to find a way of getting this out to clean underneath the coils, so that makes cleaning very difficult. Again, bad design. Although a basic stove, I would not recommend it. Rated 4 out of 5 by Jonita from Easy cleaning, cooking & observing. I purchased my 54cm freestanding electric range after having a similar Chef for 26 years. I had terrific performance from my previous range and hopefully will get same from this one. The oven in current model is superior because it is fan-forced & viewing is easy as you have a permanent light. A little restricted access I thought in the grill section but easy cleaning on top and overall I am very pleased with it. Rated 4 out of 5 by Rhino from Good Product Everything is going good. Very well priced and figment was easy. Recommended. Rated 3 out of 5 by Susans from Grill tray problem I brought this last month to replace a chef stove that I had for 40 years, I am very disappointed in the design of the grill section as unable to pull the grill tray out all the way, so therefore unable to use the entire grill tray & it is hard to replace after taking it out to clean. Obviously the designer does not do any grilling. Rated 4 out of 5 by petra from My new Chef stove. Landlord bought to replace the existing stove. I love it apart from not being able to clean under the top elements. I have made my own drip trays as the store bought ones are not big enough. Fortunately I do not grill as it would be a pain.